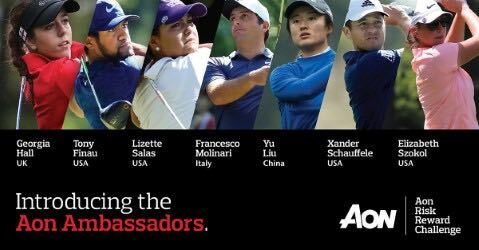 Aon plc (NYSE: AON), a leading global professional services firm providing a broad range of risk, retirement and health solutions, today unveiled a diverse lineup of ambassadors who recognize the importance that data-driven insight plays in optimizing performance, as part of a multi-year relationship with both the PGA TOUR and the LPGA for the Aon Risk Reward Challenge. Hall won her first LPGA title in major style during her rookie season in 2018, claiming victory by two shots at the Women’s British Open. That breakthrough gave her a huge confidence boost and she is fast gaining a reputation as one of toughest competitors in women’s golf. Hall, and her closely knit team of coaches and family are working to continue to grow her game and professional standing as she enters her second season as an LPGA member and aims to represent Europe at her second consecutive Solheim Cup.